Dr. Joshua Valentine was born and raised in Elizabeth, West Virginia, where he grew up playing sports and enjoying the outdoors. He graduated from West Virginia University with a Bachelor’s degree in Exercise Physiology and spent the next two years working as a Personal Trainer at Pro Performance in Morgantown, West Virginia. He relocated to Dallas where he completed his Doctorate of Chiropractic (D.C.) from Parker University. In addition, he has successfully completed an internship at the VA Hospital in Dallas. Dr. Valentine is passionate about creating healthy families through quality chiropractic care. 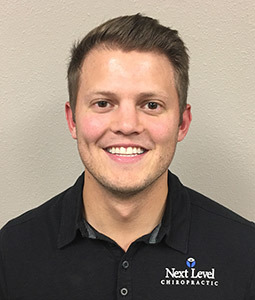 He is Webster technique certified, which is a specific chiropractic analysis that helps optimize neuro-biomechanical and physiological function to support a more comfortable, safer, and easier birth for pregnant women.